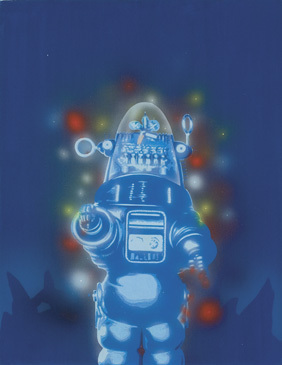 Original Jim Thomas artwork of Robbie the Robot from Forbidden Planet, published in Cinefantastique (Volume 4, Number 1). Jim Thomas's illustration for CFQ's first article on Forbidden Planet was published in Volume 4 Number 1 (1975), one of the earliest issues published and long before the famed double-issue on the same film. Clarke's subject told of his love for the film: "FORBIDDEN PLANET is rarely matched, even today, in its scope, beauty and boundless imagination." The article was written by Steve Rubin, co-author of the Forbidden Planet double-issue. The artwork is accomplished in acrylic on board, and measures 17 in. x 22 in. The collection of Cinefantastique publisher Fred Clarke. When Fred Clarke published his first issue of Cinefantastique magazine in the fall of 1970, few realized that it would become one of the longest lasting and continually published of Hollywood's many industry magazines, especially with its niche reporting of science-fiction film and special-effects wizardry. Under Clarke's guidance, CFQ became an influential, and at times controversial publication of which even the L.A. Times took note, labeling it "the little magazine that could" in a 1986 piece. CFQ featured full-color covers, and was renowned for giving behind-the-scenes information on personalities and creative decisions that, althoughvery commonplace today, were taboo during CFQ's early days when the studios practiced strict control over their film publicity. The magazine's hallmark, though, was its exhaustive retrospectives on films such as Them, Forbidden Planet, The Incredible Shrinking Man and other early science-fiction classics, offering an emphasis on the technical sophistication of these films, as well as their underlying themes. 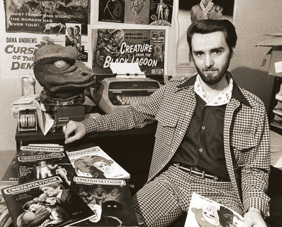 As CFQ grew in success over the next 20 years, Clarke branched out into other publications such as Femme Fatales - which editor Bill George termed a "Sports Illustrated Swimsuit Edition of Cinefantastique" - as well as Imagi-Movies and Anime-Fantastique. Femme Fatales was enormously popular from day one, and it soon surpassed parent CFQ in sales. Clarke was a huge fan of the films he covered in his magazines, and he amassed an impressive collection of original cover artwork created for Cinefantastique and his other publications. Along the way, Clarke also acquired some key pieces of science-fiction props and set pieces through his many relationships with industry propmakers, art directors and costumer designers. Perhaps most important among these many treasures are a number of Gene Roddenberry's personal hand-annotated scripts from Star Trek, as well as the famous "Gorn" mask used in the Star Trek original series episode, "Arena". This amazing piece was previously considered lost, and only recently surfaced after Clarke's death in 2000. Offered here are select items from Fred Clarke's estate. Each of these lots - be it original CFQ artwork or rare collectibles of science-fiction film - is a testament to Clarke's legacy as a pioneering force in film journalism, who brought the wonders of science-fiction and fantasy films to a wider audience.